I recently spent two weeks shooting wildlife in Borneo (with my camera), sweating like a pig and bathing in DEET to fend off the ferocious mosquitos. Well, actually it was just one week shooting wildlife, for most of the second week I spent feeling rather unwell in bed. Thankfully the last 6 days we had planned as downtime on Gaya Island, so I didn’t miss out on too much wildlife action, just a little snorkeling and lots of yummy food. So why Borneo? 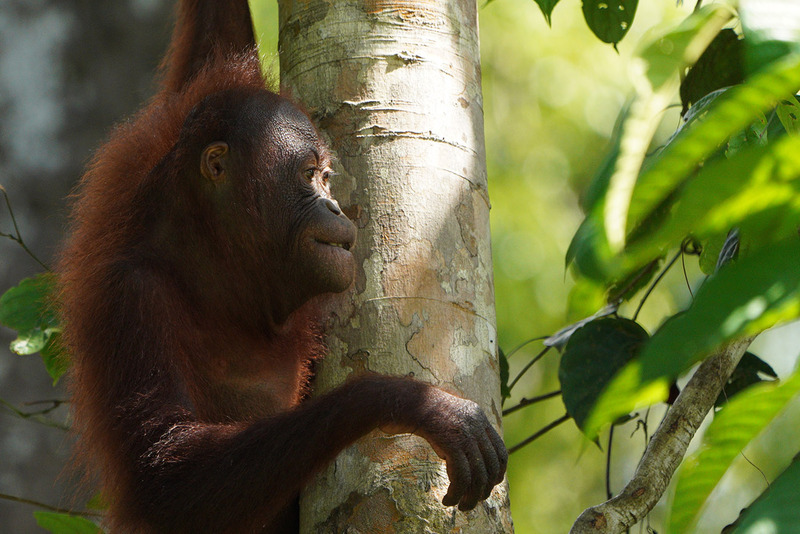 Along with Sumatra, Borneo is one of the only places on Earth where rhinos, orangutans and elephants live together. 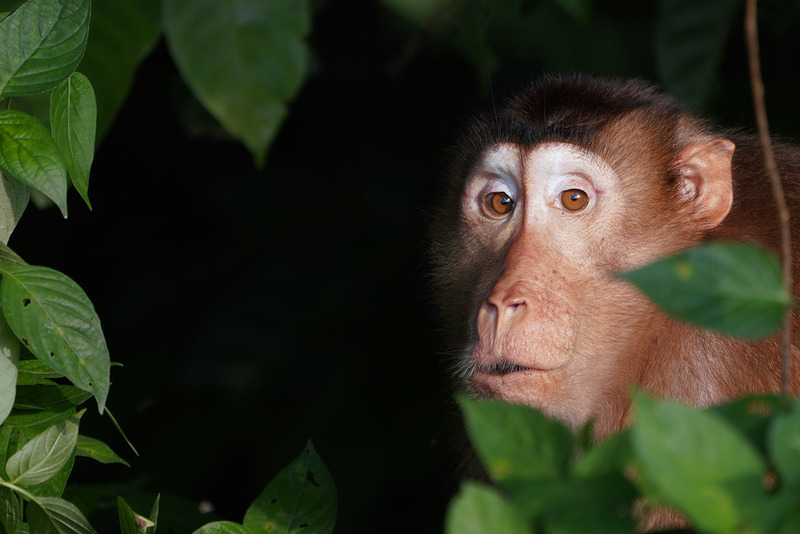 There’s also the proboscis monkey, sun bears, clouded leopard, flying fox bat and the pygmy elephant. Also my better half (Charlotte) had already been 3 times, so I figured it couldn’t hurt to take a look for myself. *Note: Other than cropping to my liking, only a couple of images here have been post processed and I’ll mention which. Full resolution SOOC JPEG images are also available to download. RAW files are also available but password protected to help keep my hosting costs sensible. However, I do provide the username/password to all members of my monthly GAS email. All images are copyright protected and may be used for personal use only. 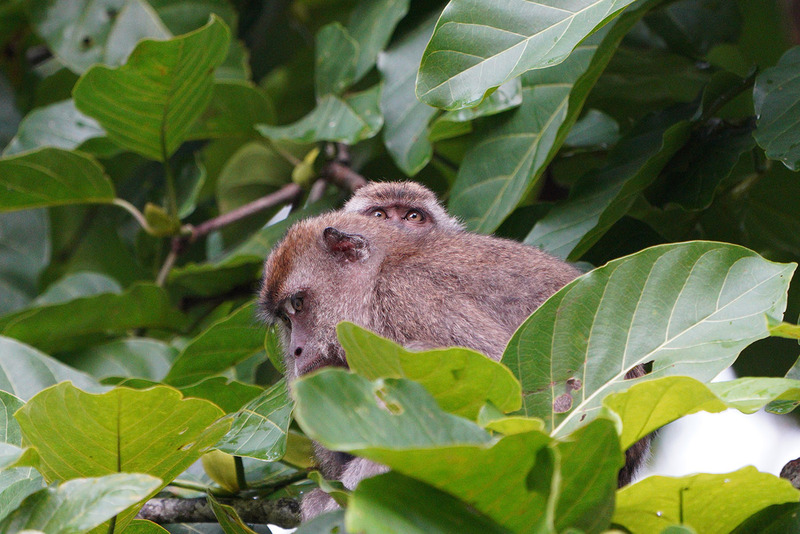 If you ever visit Borneo then you will see lots and lots of long-tailed macaques. 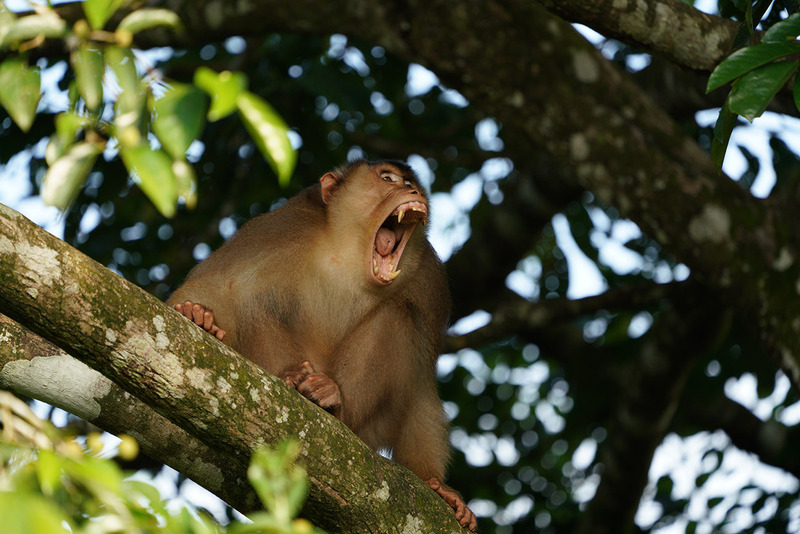 This particular shot was taken from a boat on the kinabatangan river where we spent one night at the Abai Jungle Lodge. I knew that the low light conditions in the jungles of Borneo would provide a challenge for any photography gear, so now that I’m back am I still happy with my choice of packing the a7R III and FE 100-400mm GM lens for shooting wildlife in Borneo? I’m afraid that you’ll have to read a little further to find out! I own quite a few Alpha cameras so deciding which one to take on the trip gave me quite the headache. I had the choice of the Sony a7 III, the a7R III, or the a9. Ultimately I settled on the a7R III. I knew that I would probably be shooting subjects from quite some distance, so concluded that the extra resolution would allow for more aggressive crops compared with the other two cameras. I was a little concerned about shooting in low light conditions and know that both the a7 III and a9 are better in low light compared with the a7R III. However, you only really start to notice this above 6000 ISO which I hoped I wouldn’t be shooting too many shots above. The lens choice was really a no brainer. I’m fortunate to own the Sony FE 100-400mm GM lens (read my full review here), so this was definitely coming with me. I also own both the 1.4x and 2x teleconverters. The 1.4x is brilliant and you only lose one stop of light, so I packed this. I left the 2x behind as you lose 2 stops of light and this pushes the 100-400 GM to f/11 at 400mm. AF slows down a lot on the a7R III at f/11 since phase detection no longer works at this aperture, the image from the 2x is also noticeably softer. I also packed the FE 90mmm F2.8 Macro and the FE 16-35mm F4 lens. However, in hindsight I would have left these two at home as I barely used them. I also brought the Sony RX100 IV which was well used and definitely worth brining along. I didn’t take a backup body, however I did equip Charlotte with the Sony a6300 and the 55-210mm lens for a nice lightweight setup with reasonable reach. So without further babble, here are some of my favourite shots from our wildlife adventure in Borneo, all shot handheld. I did take my Sirui P-224C (affiliate link) monopod with me but I never used it. Noise reduction was also turned off in-camera. 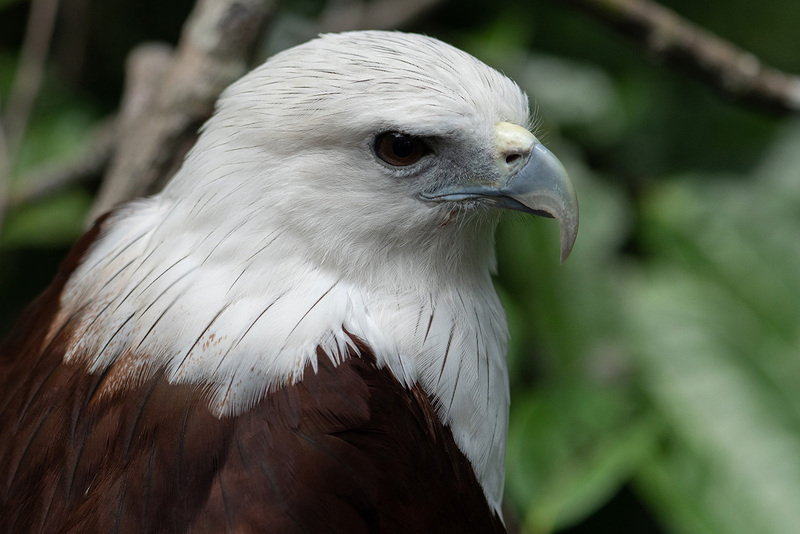 As we were walking around the canopy boardwalk of the Sun Bear Conservation Centre in Sabah this gorgeous brahminy kite decided to perch literally only a meter away from the boardwalk, if anything it was too close! 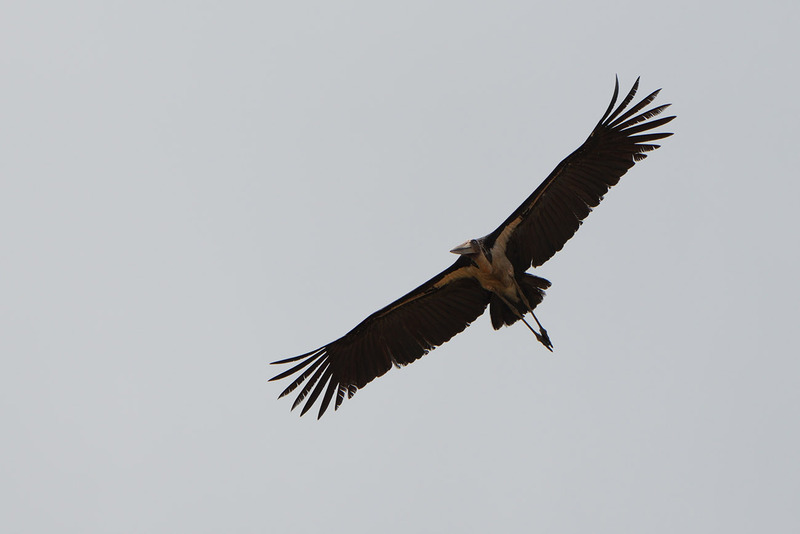 We were very lucky as as we went back the next day and only spotted it soaring high above. I did a little highlight recovery in Lightroom here to bring back some of the plumage details, I could have avoided this if I’d exposed for the whites better. 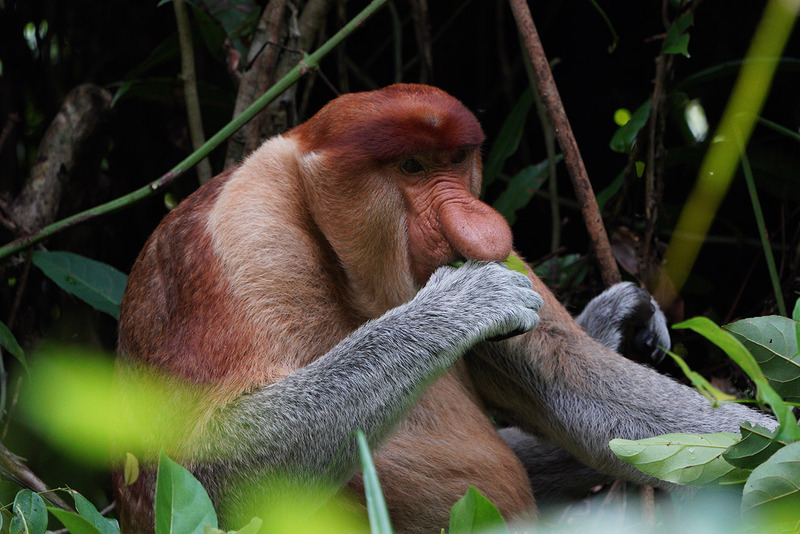 This is the proboscis monkey or long-nosed monkey which you will only find in Borneo. They never stray far from the island’s rivers, coastal mangroves, and swamps. 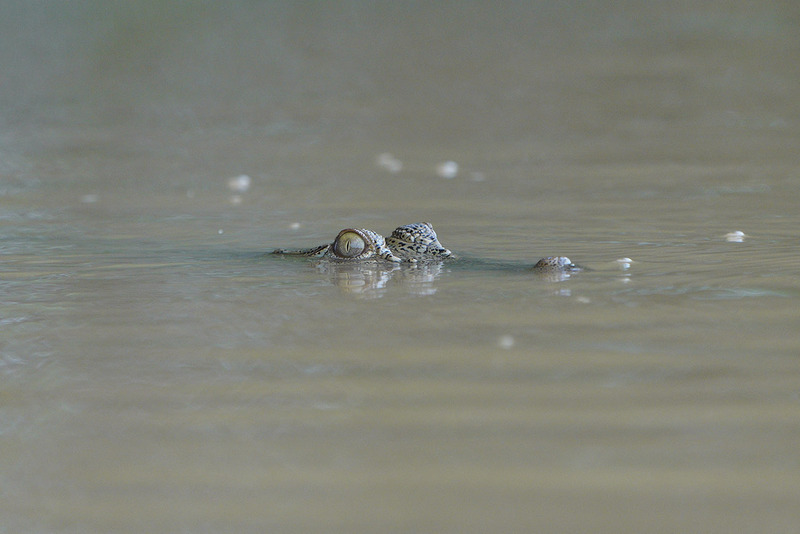 As well as the big nose they also have webbed feet and hands to help them outpace the crocodiles that are some of their main predators. 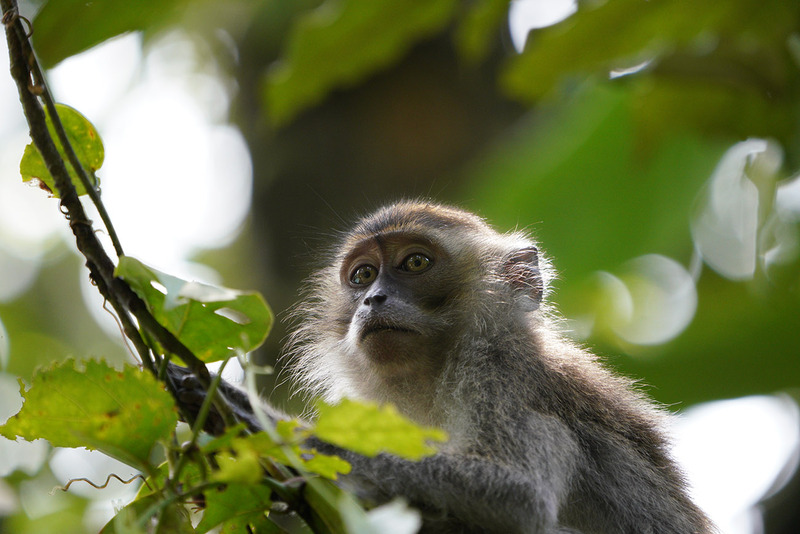 Unfortunately, the rampant clearing of the region’s rain forests for timber, settlement, and oil palm plantations has depleted their habitat and numbers have declined by as much as 50% over the last 40 years. 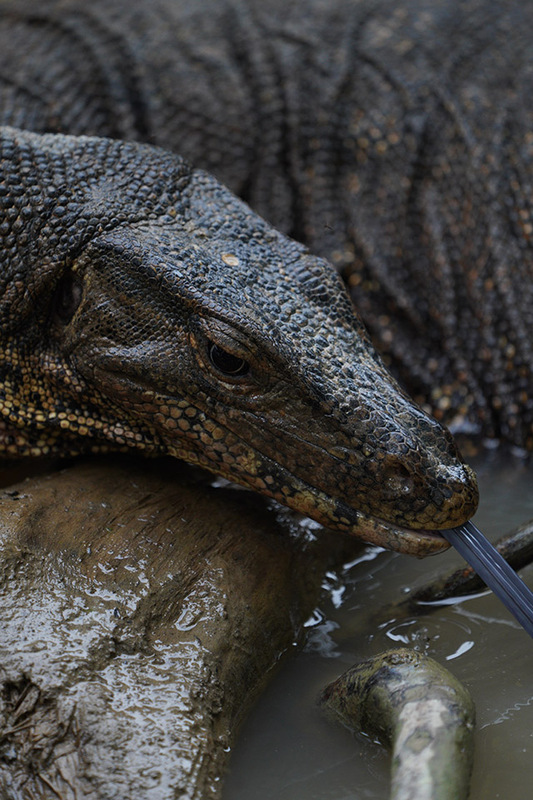 On our first day at the Abai Jungle Lodge we spotted this water monitor lizard which can reach lengths of over 3m. This particular one was probably around 2m in length and had just taken a fish out from under a log for a bite to eat. I was hoping to see lots of giant man eating crocodiles as we cruised down the kinabatangan river in our little boats. Unfortunately we didn’t spot so many, and those they we did spot submerged themselves very quickly. 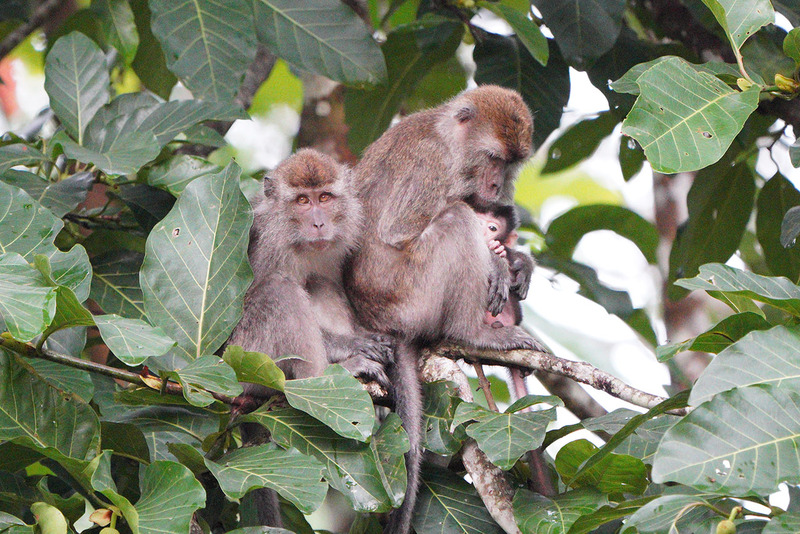 Unlike the orangutans which are very rare to spot in the wild, we saw lots of long-tailed macaques which can live in groups of up to 58 individuals. 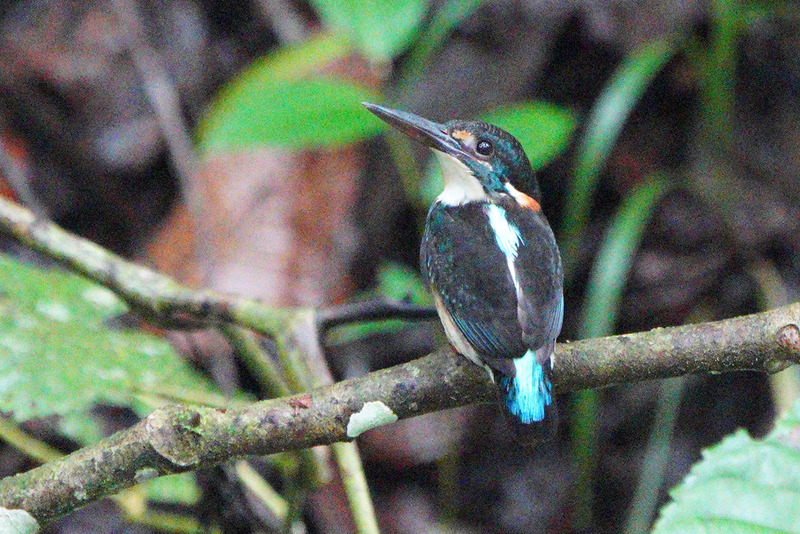 Borneo is home to 12 beautiful kingfishers. 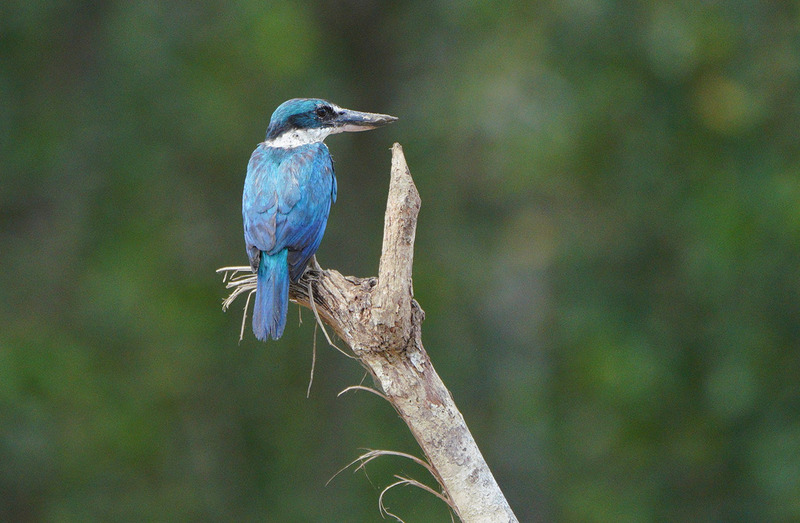 We spotted this collared kingfisher along the banks of the kinabatangan river. 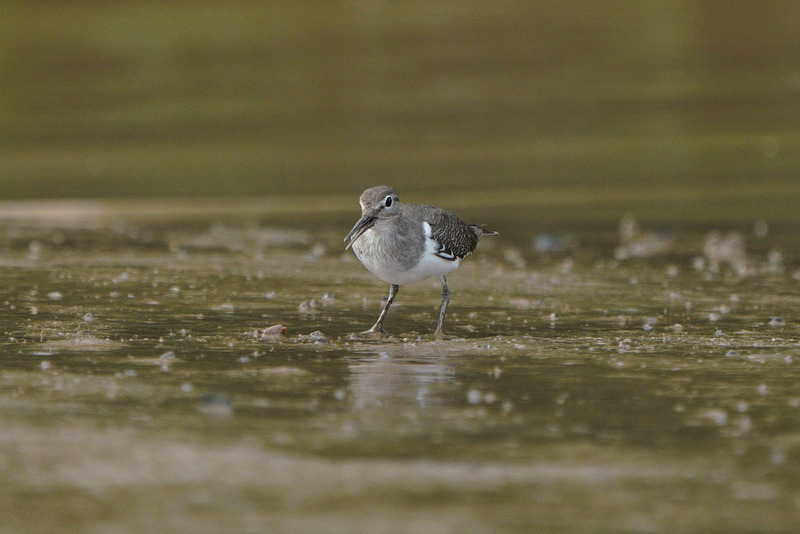 This wood sandpiper was busy looking for grubs as we cruised past. 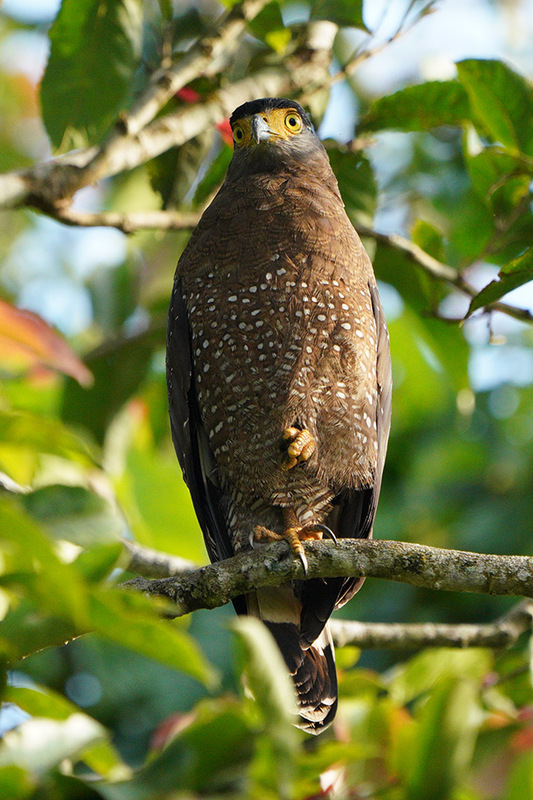 During our stay at the Tabin Wildlife Reserve the crested serpent eagle was a common site. During an evening drive we were able to get within just a few meters of this medium-sized bird of prey. 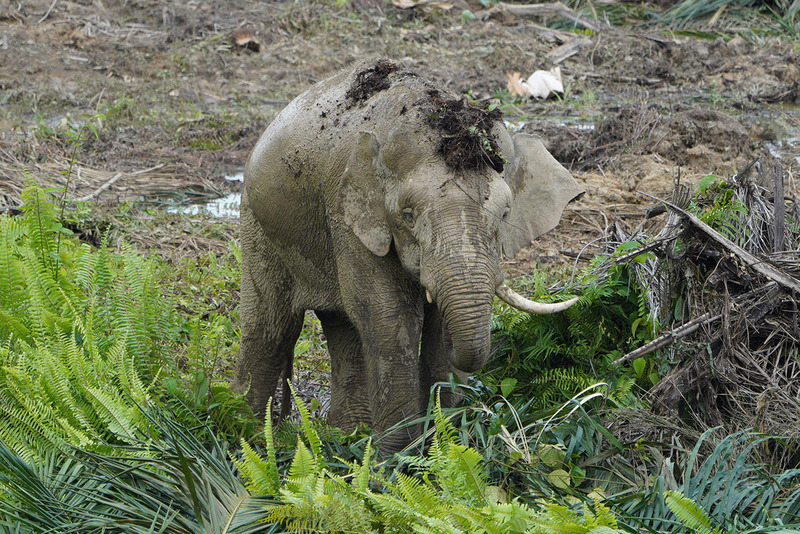 This is Borneo’s endangered pygmy elephant. Largely thanks to palm oil there are only around 1,500 pygmy elephants left in the wild in Borneo and they are a very rare sight. 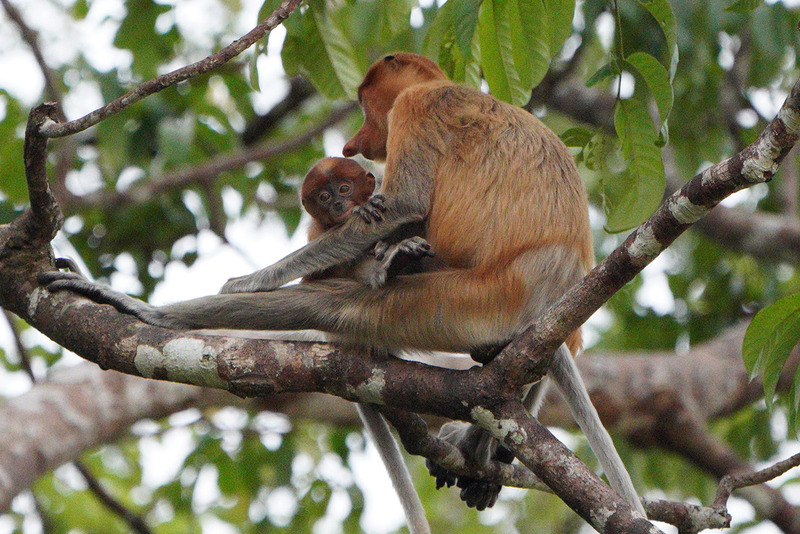 We were fortunate to see them on the day that we arrived at the Kinabatangan River Lodge. Unfortunately they were munching away in the middle of a palm oil plantation, but they seemed happy with the abundance of food. 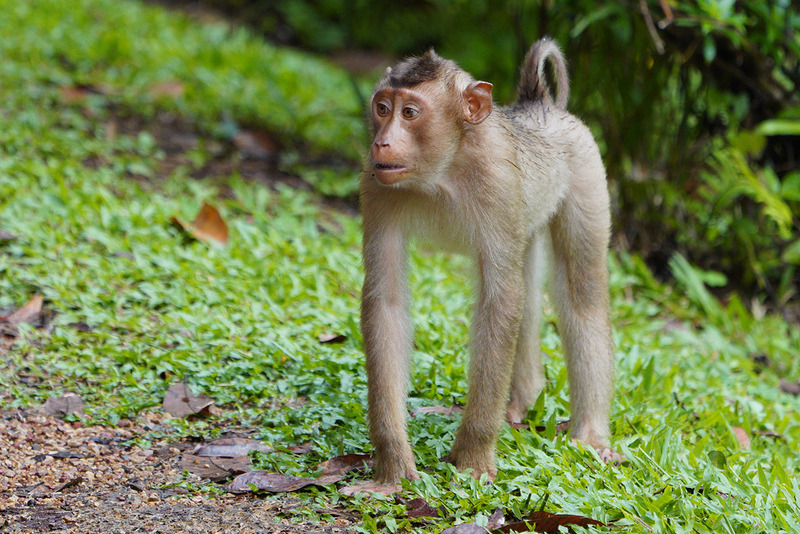 As well as the long-tailed macaque there is also the pig-tailed macaque. Apart from their tails they look practically identical. We spotted this little guy as we were leaving the Tabin Wildlife Reserve for a drive one evening. 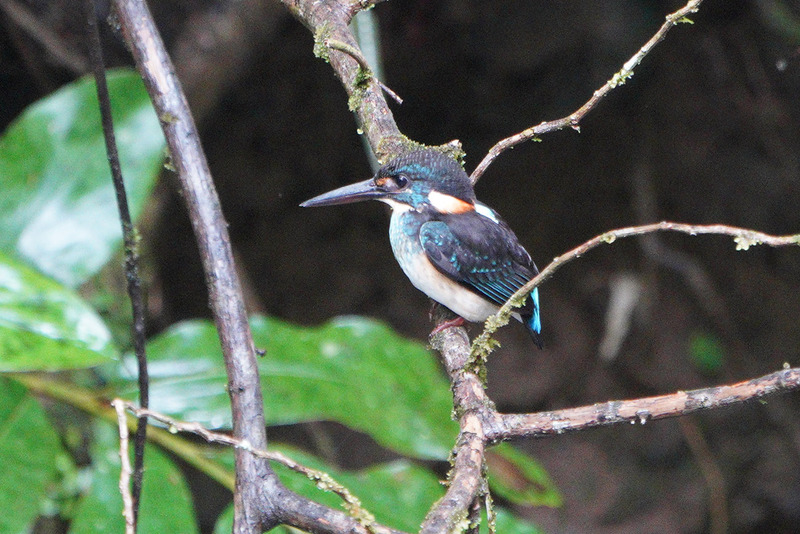 I pushed the ISO all the way to 25600 as I captured this blue banded kingfisher in the Tabin Wildlife Reserve. I got the shot, but the noise here is definitely more than I’m usually happy with. Bringing the shutter speed down to 1/160 helped me get the ISO down to 4000 for this second shot. 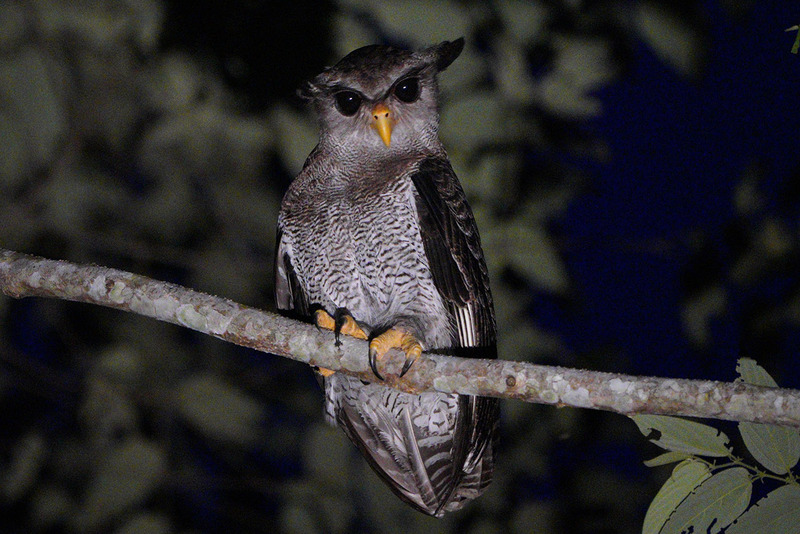 During a night drive through Tabin we spotted this Barred Eagle Owl. I’m not fond of blinding wildlife at night, so I didn’t bring a flash with me. Here the owl was lit by flashlight from the guides. It’s difficult to say whether it minded the light, but it didn’t fly off which it could have so easily of done. Autofocus was really out of the question here so I switched to manual for this shot and also limited my ISO to 12800. The leopard cat is a small wild cat about the size of a domestic cat. 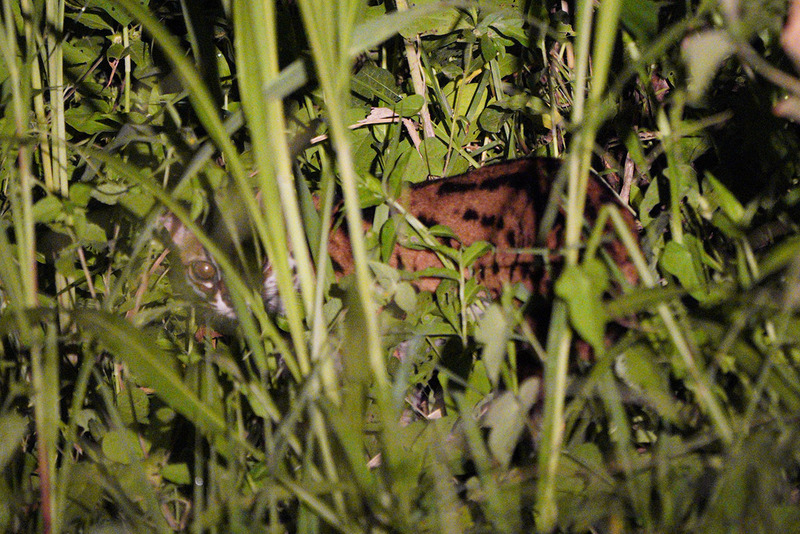 We also spotted this particular cat during a night drive. Again I had to manually focus to get the shot due to the light and also the vegetation in front of the cat. 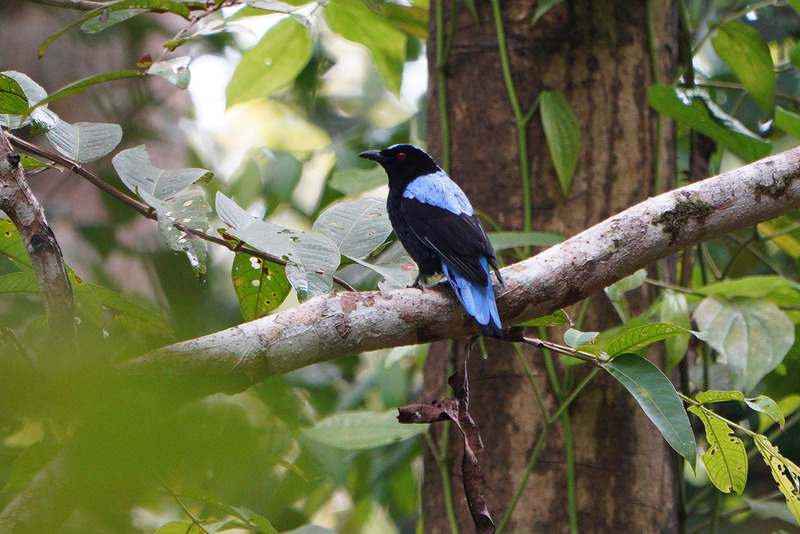 This is the asian fairy bluebird, one of over 600 different species of bird that can be found in Borneo. 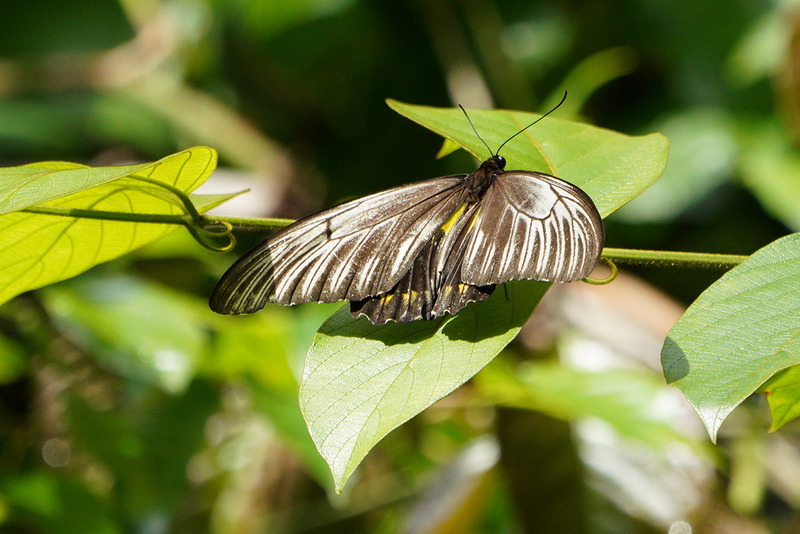 There are many colorful butterflies in Borneo. This particular butterfly was bright yellow on its underside. I’ve yet to identify its name, so if you know please let me know in the comments below. 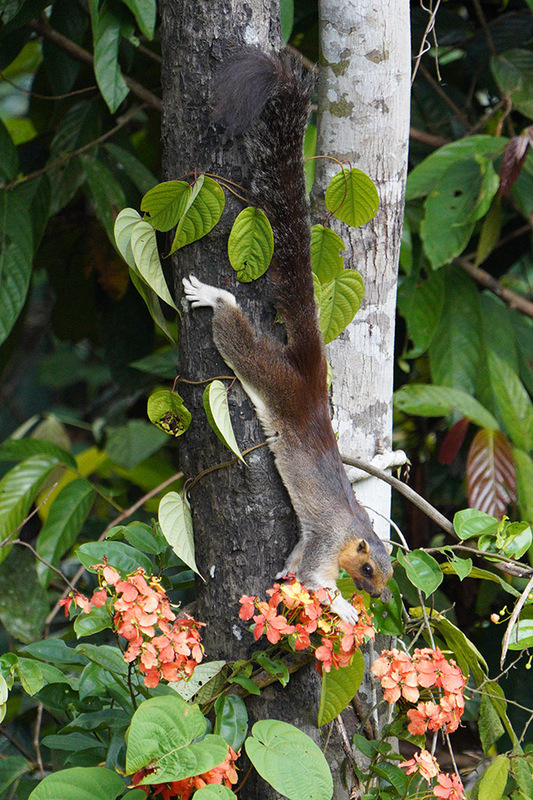 We were fortunate to spot this giant tree squirrel in the forest just next to our balcony during our stay at My Nature Resort. 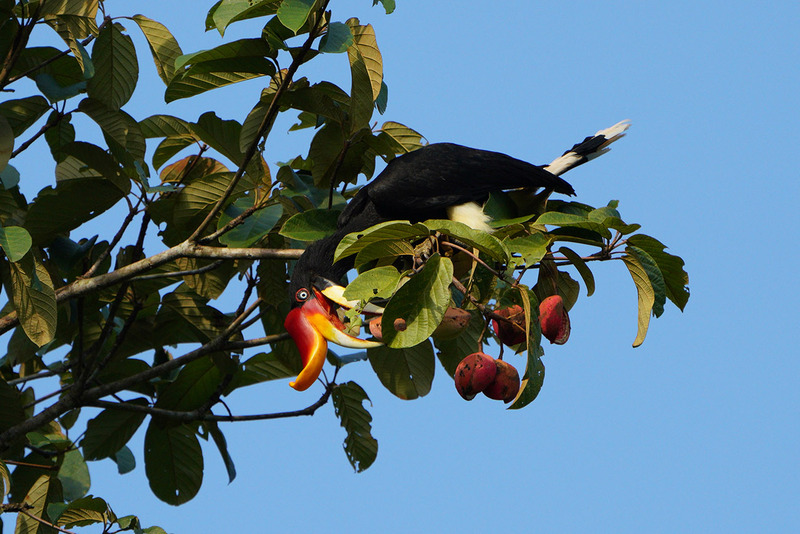 There are eight different species of Hornbill in Borneo. 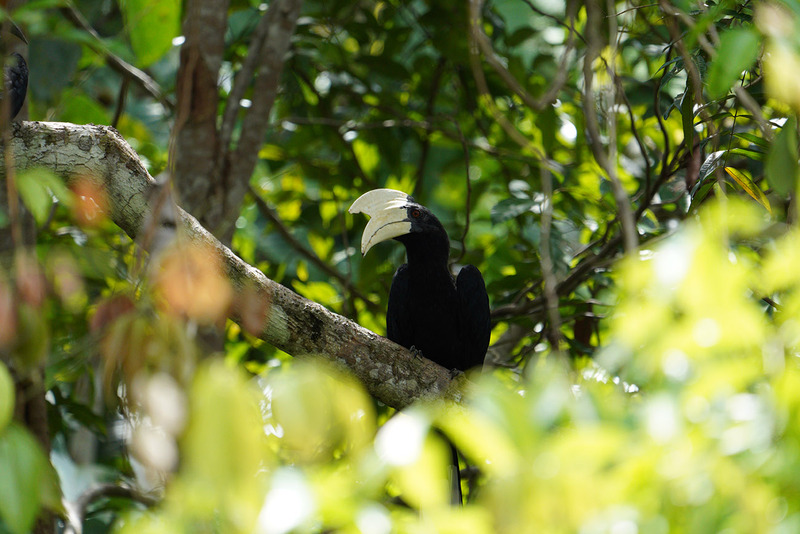 This is the Asian Black hornbill that we also spotted from our balcony at My Nature Resort. 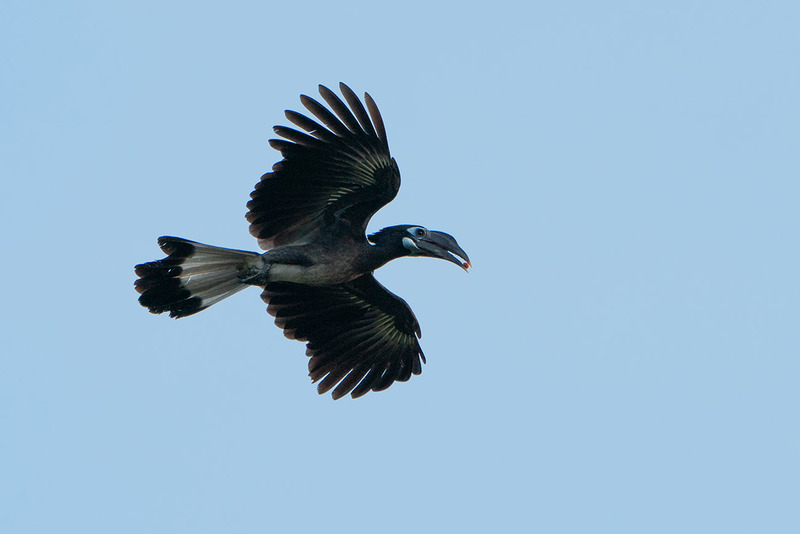 Another Asian black hornbill (I think) in flight at the Tabin Wildlife Reserve. I did a little shadow recovery in Lightroom here. This is the rhinoceros hornbill and it’s one of the largest hornbills in Borneo. 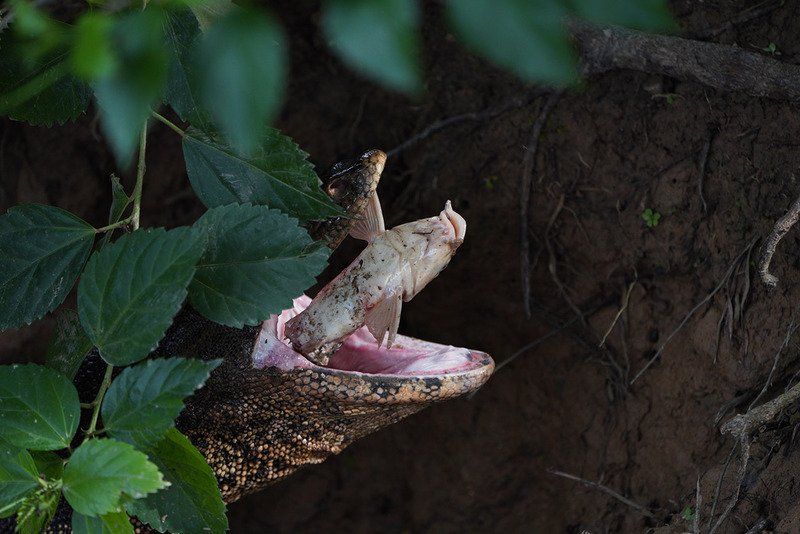 This particular one was enjoying a meal in the Tabin Wildlife Reserve. We spotted this lesser adjutant as we were travelling down the kinabatangan river for our first night at the Abai Jungle Lodge. 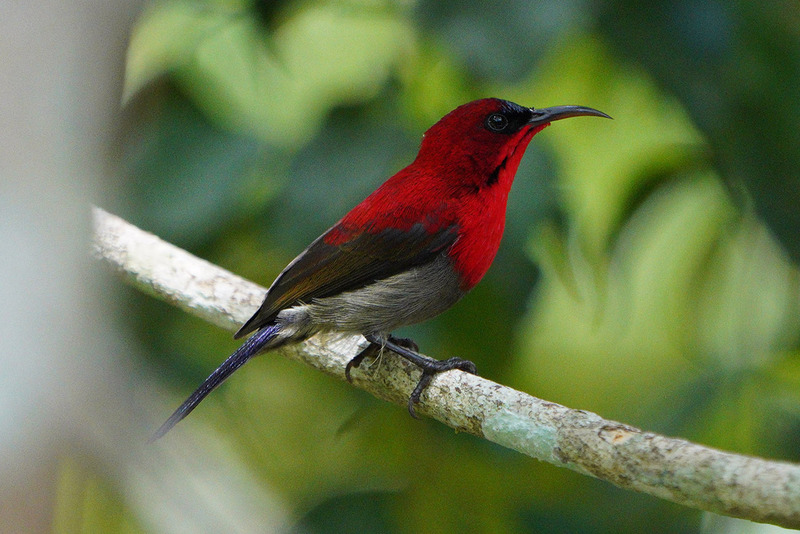 The beautiful crimson sunbird was hanging out in the trees close to the Sepilok Orangutan Rehabilitation Centre. 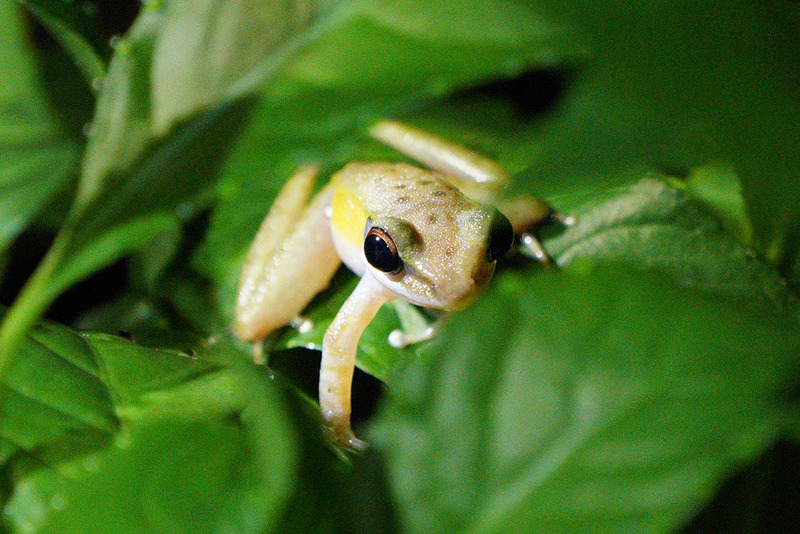 We spotted this frog during a night walk at the Tabin Wildlife Reserve. Although we think the guide said it was a runner frog, we can’t seem to find such a frog in Google so now we are not so sure what it is called. If you know, please let us know in the comments below. 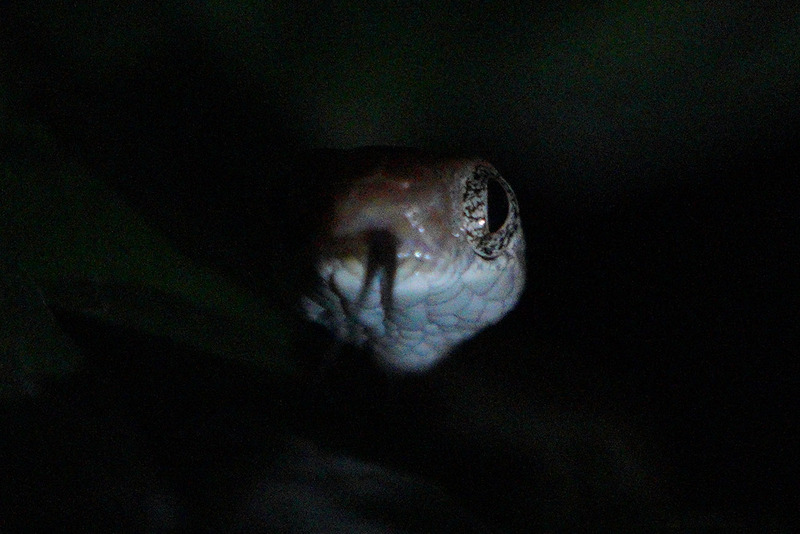 This snake was also active during our night walk. Unfortunately the guide wasn’t even sure what type of snake it was, so needless to say we didn’t get too close. This was manually focused. 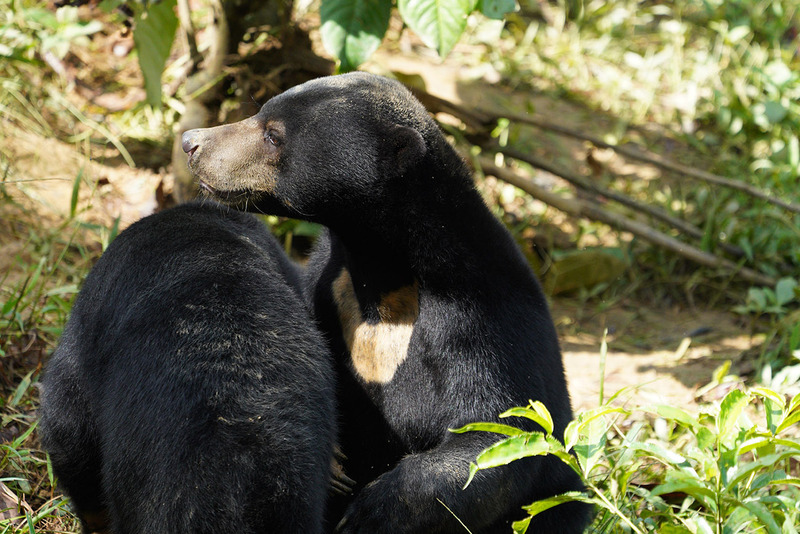 Malayan sun bears are the smallest bears in the world and are only found in Southeast Asia. Sadly these bears continue to be threatened by forest degradation and illegal hunting. We visited the Bornean Sun Bear Conservation Centre which is next door to the Sepilok Orangutan Rehabilitation Centre in the Malaysian Sabah District of North Borneo. And last but most certainly not least is the gorgeous orangutan. 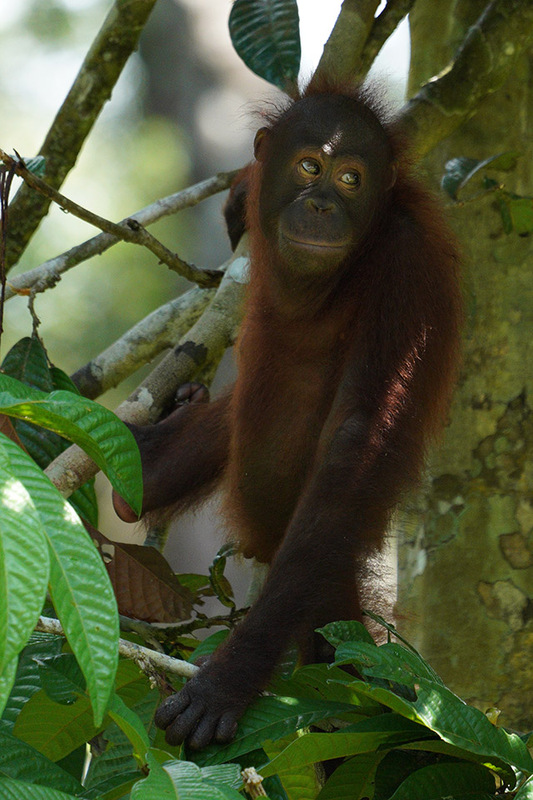 The orangutan is sadly another endangered species in Borneo due largely again to deforestation. We visited the Sepilok Orangutan Rehabilitation Centre which is a 43 sq km area of protected land at the edge of Kabili Sepilok Forest Reserve. Today around 60 to 80 orangutans are living free here. Just to note, the centre charges an additional camera fee of RM10 for lenses from 100-400mm. But if you take in a 400mm plus lens then this fee jumps to RM1,000. So was the a7R III combined with the FE 100-400mm GM a good choice for photographing wildlife in Borneo? and will I be returning to Borneo? Well hopefully the photos here have answered this question on my behalf. But yes, I’m definitely still happy with my choice of camera. As you will have noticed I cropped quite a lot of shots, so having the extra resolution to play with was very beneficial. Sure both the a7 III and a9 would have produced slightly less noisy photos at higher ISO settings, but I would rather sacrifice a little noise for the extra resolution with the a7R III, and I can also clean up some of the noise in post if I really want to. I did read another review of the 100-400 by Dvir Barkay over on PhotographyLife back in August, where he mentioned problems with condensation inside the body of the FE 100-400mm GM lens. In a couple of places that we stayed we were blessed with air conditioned rooms, but this meant that when we came out into 35c heat and 80% + humidity the lens was misting up instantly. However, after 10 minutes or so the lens warmed and the condensation cleared up, and unlike Dvir I never noticed any internal condensation build-up. I may have just been lucky and Dvir unlucky, who knows for sure but I’m glad that I didn’t experience the same issues. If I went back to Borneo tomorrow would I change any of my gear? The a7R III would definitely be coming along again and so would the 100-400mm and the 1.4x. I definitely wouldn’t be packing the 90mm macro or the 16-35 unless I planned more time for landscape photography, and the 100-400 doubles up as an excellent macro lens anyway. The RX100 IV was very useful to have and would definitely be going back in my bag. Is there anything that I could do improve my photos from Borneo? The biggest challenge is often the limited light available under the forest canopy, so if I could afford the new FE 400mm F2.8 G Master lens this would certainly help! Although I’d probably sweat even more (if that’s possible) carrying it around, but I think it would be worth the sacrifice. I own the 70-200 F2.8 G Master lens and was considering taking this with me. Ultimately I’m glad that I didn’t as most of my shots were at 400mm, so the 70-200mm would have definitely been too short. 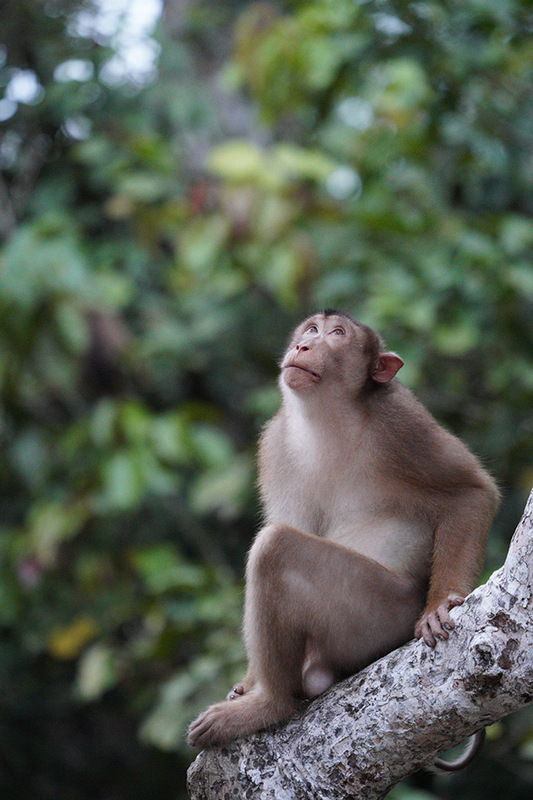 And yes, I would most definitely go back to Borneo and recommend it to others. It was an amazing experience that hopefully I won’t be forgetting anytime soon! So just to wrap up. The 100-400mm is really a great lens for wildlife shooters and with the resolution of the a7R III you’ll have an excellent tool at your disposal, no animal will be safe! If you are considering purchasing this lens then I’d recommend reading my full Sony FE 100-400mm GM Review where you’ll also find many more sample images of not only wildlife, but sports and aviation too. If you have your own experiences to share with shooting wildlife in challenging environments, then please do drop a comment below. And if you are on Facebook then our Sony Alpha Wildlife Shooters Group is a great place to show your images or ask any questions you may have regarding wildlife photography and Sony Alpha gear.